If you're looking for a great basic men's t-shirt - then check out our latest 4 pack tee shirts from Bolter. This is our super soft lightweight everyday crewneck tshirt. Use it as an undershirt or wear it as an outer shirt on hotter days. The plain or solid color shirts are 100% cotton - nice and cool for summer time or for layering. The Heather colors (heather grey, heather charcoal, heather brown, etc.) are a cotton/polyester blend. 52% Cotton 48% Polyester. The 100% cotton colors will shrink a little in the wash. Keep in mind these have a european cut to them so they are slim through the body. If you're in between sizes we recommend sizing up. The cotton/poly heathers will not shrink as much and is something to note. Earth Tone pack contains two heathers and two solids. 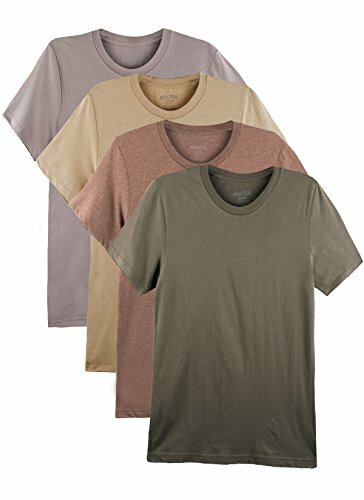 Heather Tan (52% Cotton, 48% Polyester), Pebble (100% Cotton), Army (100% Cotton), Heather Brown (52% Cotton, 48% Polyester). If you have any questions about this product by Bolter, contact us by completing and submitting the form below. If you are looking for a specif part number, please include it with your message.